Research in the booming flower business in Malaysia is showing the positive effect on growth and yield from using Granular Polysulphate. Cut-flower production in the Cameron Highlands of Malaysia has grown fast. Most of the more than fifty varieties of Chrysanthemum cultivated in the area are destined for export to countries such as Japan and Australia. Stringent quality requirements of this demanding market mean that growers are keen to adopt technical improvements that improve stem strength and vase life as well as flower heads. In an experiment currently underway, a control plot of conventional fertilizer is being compared with a plot where Granular Polysulphate has been applied as well as the organic fertilizer. The first phase of monitoring has taken place with observations for visible difference to root, stem and foliage and overall health and resilience. The second phase will take measurements of cut flower quantity, percentage marketable, size and stem strength as well as cut-flower shelf or vase life. 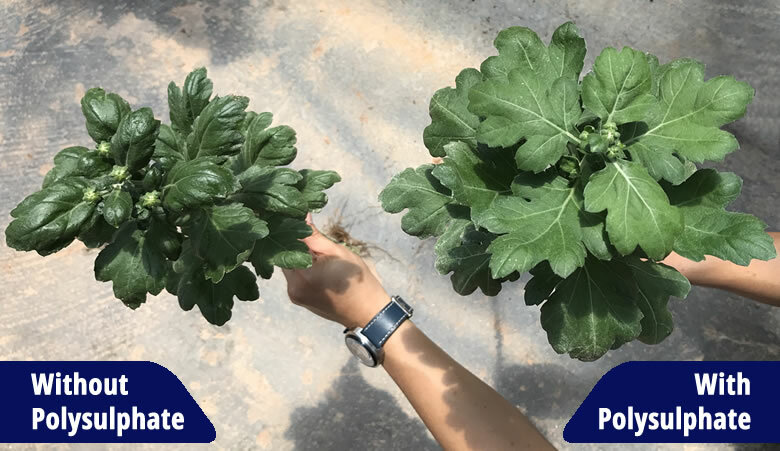 The chrysanthemum plants that had the application of Polysulphate have been measured to be more vigorous, with better roots, bigger stems, greener leaves and more uniform growth. The higher levels of potassium and calcium conferred higher resistance to disease and improved drought tolerance. Together with the magnesium and sulphur in the multi-nutrient Polysulphate, the prolonged availability of the nutrients provides a continuous supply of nutrition and hence consistent growth of chrysanthemum. The next set of results from the Malaysian chrysanthemum experience will be published soon.